Icelandic investment group Baugur has scrapped its takeover approach for UK menswear firm Moss Bros.
Baugur said recent changes to the make up of Moss Bros's share register meant that the risk to completing the takeover was "unacceptable". In February, Moss Bros received a 42p-a-share bid approach from Baugur. Since then a number of groups have raised their stakes in Moss Bros, including Laura Ashley which last week increase its stake to nearly 10%. "We are disappointed by recent developments that have effectively frustrated our proposed offer, but remain supportive of the management team," said Gunnar Sigurdsson, Baugur Group's chief executive. "Baugur is keen to continue to work with the board, management and other major shareholders to identify ways to unlock the potential in the business." 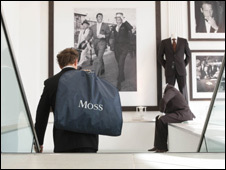 In April, Moss Bros reported a pre-tax loss of £1.4m for 2007, against a profit of £5.1m in 2006. Shares in Moss Bros closed 11.5% or 5.2p lower at 40.2p.